Police seized large amounts of steroids, tranquilizers and sexual-performance drugs in raids on seven Pattaya pharmacies. 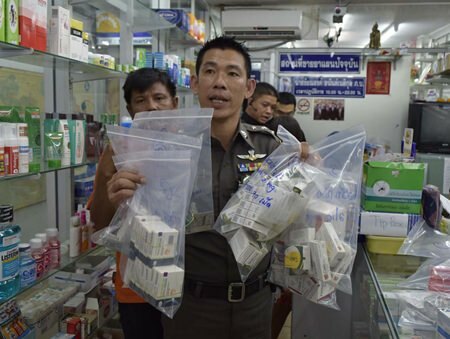 Sixty Department of Special Investigation officers working with Consumer Protection Division police and Food and Drug Administration officials hit drugs stores throughout Pattaya following a complaint from the Australian embassy that steroids from Pattaya were being smuggled down under. The squad first raided the Drug Station on Soi 13/1, finding codeine and Viagra. Raids continued at Health Pharmacy where the same drugs and unidentified steroids were seized. At the Siam drugstore officers 65 packs of Kamagra oral Jelly, four boxes of knockoff Cialis, Kamagra tablets and a tube of Kamagra Power. The Thailand drugstore yielded a cache of 50 packs of Viagra gel and 25 packs of Viagra tablets. Six boxes of Test-Prop100 steroids, a bottle of Anbol tablets and more Viagra was seized from the Mim pharmacy. A box of Vitagon was confiscated at the Top pharmacy and officers came up with no contraband at the Top 2 drugstore. Owners or managers of all the shops were arrested and held on charges of selling unlicensed medication.